The Sheep Whisperer: The Dolphins Not From Miami! The Dolphins Not From Miami! 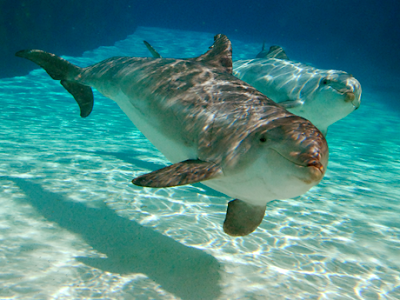 Bottlenose Dolphins are well known for their numerous appearances at a variety of aquarium shows. Leaping up to 16 ft. high really "Wows" the crowds, & even cools off the front rows! Their intelligence, permanent smiles, & advanced abilities to do complicated tricks, all make them very popular stars. When Ewe Smile, the whole aquarium Smiles with Ewe! blowholes. Injured Dolphins will even send out "distress" calls, which schools in the area will immediately respond to. We are the "Pod Squad" at Ewer service! 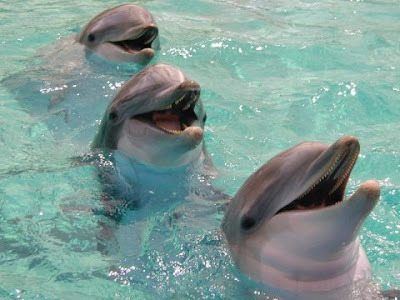 Dolphins are mammals & are incredible carnivorous creatures. They measure 10-14 feet long & weigh up to 1100 pounds. They are also able to swim at speeds of over 18 mph, surfacing 2 or 3 times per minute for air. They live in captivity for 45-50 years! "Communicate, Communicate, Dance to the Music!" to 1000 clicking sounds per second underwater, waiting for the sounds to bounce off an object nearby. Once detected, information about the size, shape, & location is "bounced" back, & assists the Dolphins in locating prey & predators. Closed for lunch! Out Fishing! "Sounds" Good! Dolphins employ a variety of strategies to catch fish. First, they use the "kerplunking" method in which they slap a fish out of the water & stun it with their tail flukes. "Kerplunking" also is used to smack the water with their tail flukes, scaring the fish into moving. 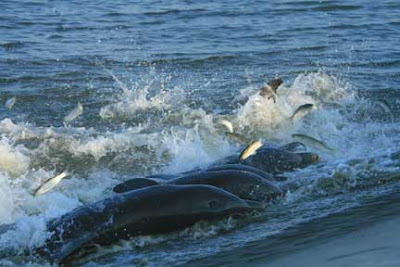 "Strand Fishing" is another strategy used, in which a team of dolphins drive fish into the shore by creating a wave that washes them ashore in low tide, making an easy meal. Time to "School" these fish on how Teamwork works! Sheep & Bottlenose Dolphins do share something in common. Sheep herd together in large numbers for added protection against predators. 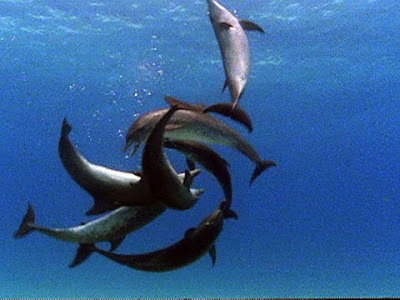 Dolphins do the same in open seas, able to keep sharks & killer whales at bay, swimming in groups of up to 1000! Sheep, unlike the Dolphin, also have the Shepherd as a secret weapon to assist them! Have Ewe seen the movie " Safer by the Dozen"? 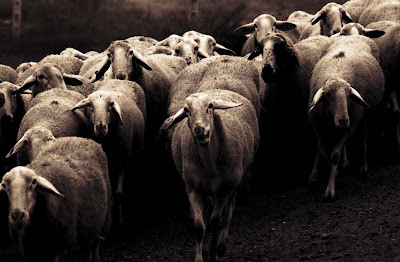 Today, as Ewe travel the first few days of the New Year, know that Ewe don't walk it alone. Ewe have family, friends, & a Good Shepherd to walk with Ewe! I am a consultant for SeaWorld Parks, and I noticed that you used a bottlenose dolphin photo of ours on this great post about dolphins. We love that you thought the photo was good enough to use, and especially for such a good cause, highlighting one of the most amazing animals of the sea! I'm reaching out today with a small request, that you cite SeaWorld properly on the page. 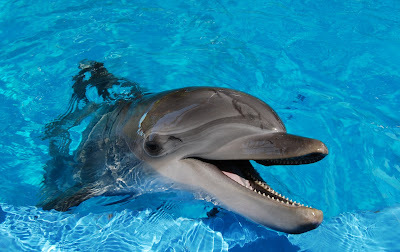 You could simply link to the original image source, here: http://seaworldparks.com/seaworld-sandiego/Animals/Know-Our-Stars/Bottlenose-Dolphins, and that would be totally fine with us. Just want to make sure all the love is getting passed around! Thanks again and please keep writing about bottlenose dolphins! The Newton that's not a Fig! X-Men & Chariots on Fire! Orca, Whale of a Tale:Take 2! Orca's Whale of a Tale! The Dolphins Not From Miami,Take 2!